Since coated fabrics such as vinyl were invented in the early 1900’s, the industry has constantly been reinventing itself with fabric technology changes. Coated fabrics are engineered composite materials, produced by a combination of a textile fabric and a polymer coating applied to the fabric surface. As the material is engineered and involves technical processes, research and development departments are always looking for ways to improve. By adjusting the mechanical properties of our PVC, we have achieved better thermal stability and additional resistant to acids (citrus fruit, vinegar etc.) & bases (bleach, cleaning agents, etc.). In addition, we use a higher quality of PVC, so that it is easier to recycle our vinyl when the product reaches the end of its working life. By adapting constituent antimicrobial elements we are able to achieve a dual improvement with our vinyl. First, our antimicrobial elements were brought inline with REACH requirements, REACH is a European Regulation and is an acronym for the Registration, Evaluation, Authorisation and Restriction of Chemicals in the EU. Second, the improved formula increased performance against the spread of a large number of bacteria, molds, mildews and yeasts, making the fabric perform better in situations where this is a priority such as healthcare, retail & transportation. By slightly adjusting the standard weave technique, Chieftain strengthened the cotton yarn significantly in the finished product to have elevated strength parameters in all strength tests performed on our fabric. We removed phthalate plasticiser from our vinyl and now use only phthalate free materials which meet and exceed current REACH requirements, without affecting any of the performance properties. Phthalates are additives added to some plastics and are noted for having possible side effects in humans. We also improved the plasticiser barrier of vinyl to offer better performance during use. By carefully adjusting the portion of stabilisers in our fabric, we now obtain better UV (ultra violet) resistance to degradation, which enables higher performance against sunshine and weather conditions. By working in close partnership with our supplier of lacquers, Stahl BV, who are headquartered in the Netherlands, Chieftain have been able to suggest formulation updates to provide better adhesion, abrasion, flexibility and anti-soiling properties. In relation to production, Chieftain is dedicated to a continual improvement process from both a technical and aesthetic perspective, we constantly evaluate new methods and practices. For instance, currently, we are conducting research into 3D printing, a process for making a physical object from a three-dimensional digital model, where our unique cotton backing cloth is used as a base layer. 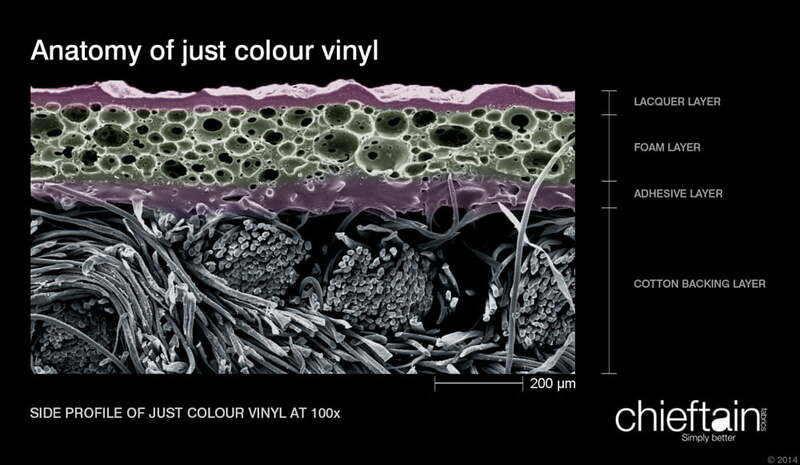 Potentially, this could allow us to ‘print’ fabric on demand in any colour, texture or pattern. Fung, W. (2000) Coated and Laminated Textiles. Cambridge: Woodhead Publishing Ltd.
Kumar Sen, A. (2008) Coated Textiles: Principles and Applications, Second Edition. Florida: CRC Press.